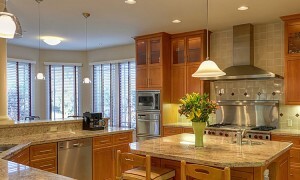 The kitchen is one of the most difficult places in the home to keep clean and organized. Between your dishes, utensils and cooking appliances, you have lots of oddly shaped and bulky items to store. If you find yourself overwhelmed by all the stuff in your kitchen, or maybe just need a more efficient way of storing and organizing, consider these genius ways to tidy up your kitchen. Grouping items together according to their use is a sensible way to organize your kitchen. Categorizing similar items makes it easier for you and your guests to find things quickly. Searching for commonly used kitchen items is frustrating. Rather than storing them in random cabinets, use a simple wicker basket to corral and hold popular items. It looks nicer than just stacking utensils on the counter and it’s more organized than stashing them in available cabinets. There’s nothing worse than having to pull everything out of a drawer or cabinet to reach something you’re looking for. Rather than shuffling with all of that mess, install slide-out pantry drawers or cabinets. Now, when you need a spice or are looking for specific dry goods, you can slide the entire cabinet out. There’s nothing wrong with showing off some of the items you own, like your formal dinnerware or antique teapots. The only challenge you’ll face is keeping it all straight and tidy on your shelves. Installing an open shelving solution will help you organize everyday kitchen items and bring an open, airy energy to your kitchen. As an added benefit, you won’t have to open drawers and doors to find the items you’re looking for. Traditional kitchen storage is great, but sometimes alternatives are just as functional. Consider storing extra kitchen items in wooden crates, baskets and other containers. Do you have a movable kitchen island with space underneath? Use woven baskets to hold your plates and bowls below. If you’re struggling to find space to organize all of your cutlery, plates and other utensils, consider high-shelf storage. Remember to only store rarely used items, like your fine china or fondue pot, on high shelves. The kitchen is one of the most popular places in the home to display knick-knacks. If your assortment of collectibles has outgrown your space, the easiest way to organize is to eliminate what you can’t put out on display. This cuts down on clutter and opens up the visuals of your kitchen. 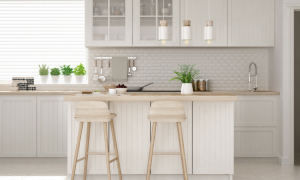 These are just a few simple ways to improve the organization of your kitchen. Now you can enjoy less frustrating meal preparation and less overwhelming visuals. A designer and her builder husband opt for 2 styles of storage. She offers advice, how-tos and cost info.